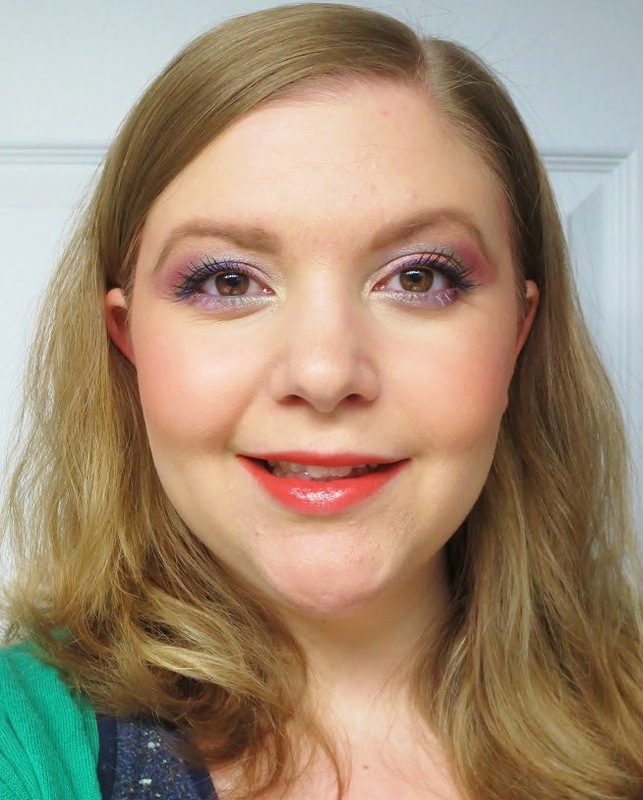 Guest Post Series: Faces of Spring, Jen from "Vibrant, Vivacious, Veracious Beauty Blog"
It's Jen from Vibrant, Vivacious, Veracious Beauty Blog! I'm a Toronto-based blogger who is properly obsessed with all things makeup and skin care and am all about embracing bold colour. 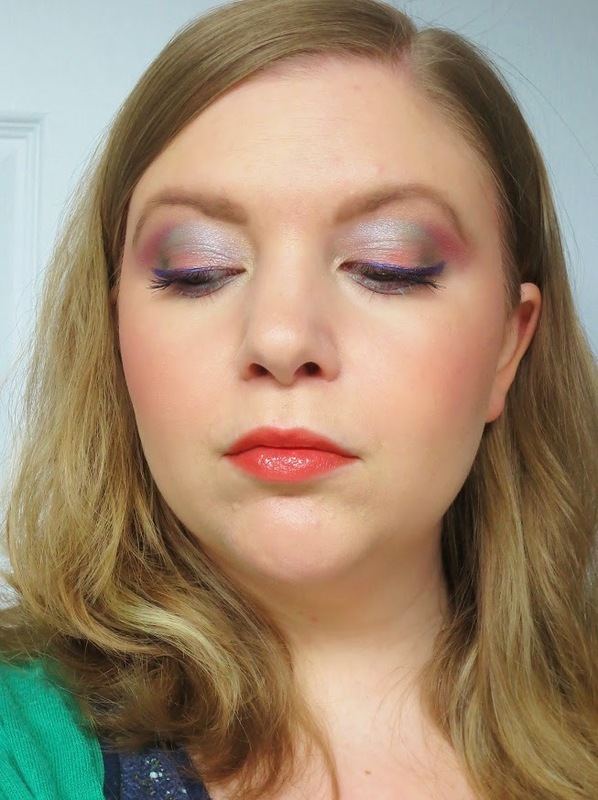 Since I love to inspire others to play around with vivid shades of makeup, I thought it would be fun to share with all of you a fun, colourful Spring-inspired makeup look. I hope you enjoy it! Since the eyes, lips, and cheeks would be sporting so much colour, I wanted to keep the skin fresh and clean. I covered areas of redness and blemishes with the best cover-up of all time, Cle de Peau's Concealer in Ivory and topped it with W3ll People's Altruist Mineral Foundation #11. Together, these create such a lovely glow! I added some warmth and a subtle contour to the skin with The Body Shop's Honey Bronze Bronzing Powder in 02 Fair Matte and created a subtle flush with a mix of Incandescent Electra and Luminous Flush blushes from the Hourglass Ambient Lighting Blush Palette. These blushes are my all-time favourite formula and the shades in this palette are so perfect for Spring! Though this probably doesn't have to be stated, the eyes really are the focus of this look! 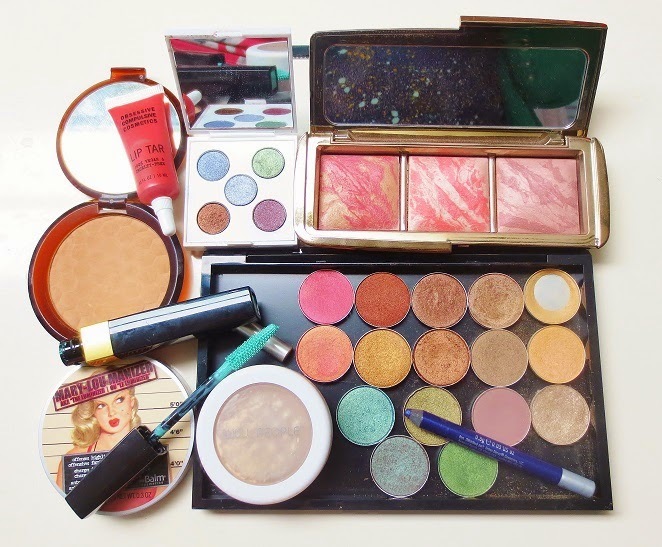 This time around, I chose some of my favourite shimmery, vibrant shadows from Yaby and MAC. Yaby's Pearl Paints are adorably tiny and utterly beautiful! 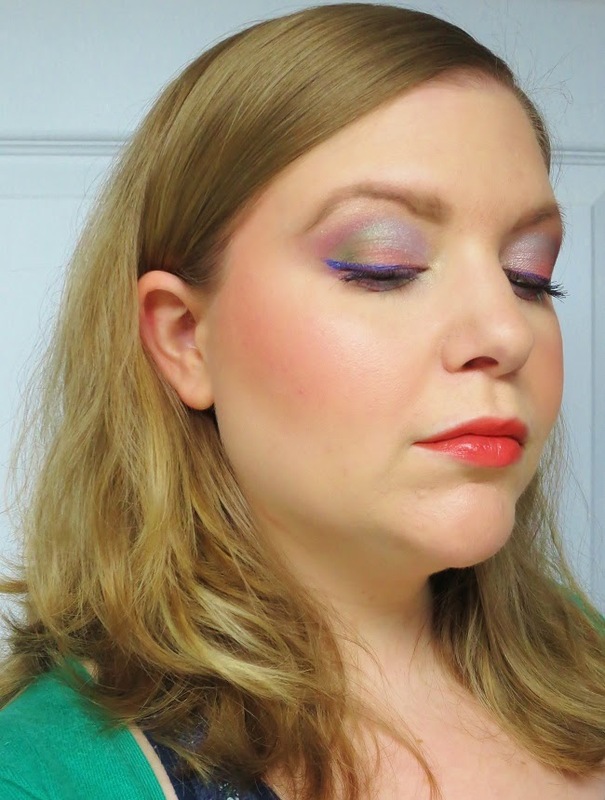 I applied a gradient of Baby Sapphire, Summer Night, and Sea Turtle (pale icy blue, sea blue, and lime green) along my crease and Purple Iris (a warm grape shade) just above my crease on the outer corners. 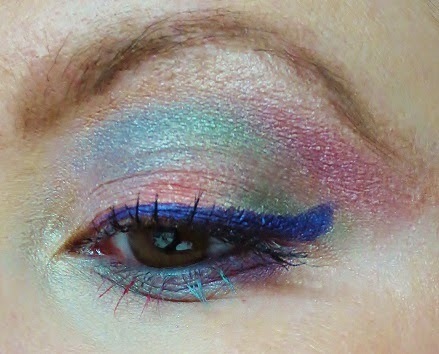 I upped the amp with a few MAC shadows, including a mix of Paradisco and Sushi Flower (on the centre of my lid) and Humid (on the outer corner of the eye). As for liner, I couldn't go with basic black! Instead, I reached for Urban Decay 24/7 liner in Ransom, a rich royal purple. I also topped my lower lashes with a coat of Chanel Inimitable Waterproof Mascara in Lime Light, a cheery mint green. Finally, I wanted to select a lip colour that was cheery and Spring-like, but not so bold that it over-shadowed the eyes. I opted for Obsessive Compulsive Cosmetics Lip Tar in Grandma, an orange-toned coral with a pretty sheen. I blotted it down to mute the colour slightly- it added just the perfect amount of colour! A huge thank you to Sara for inviting me to guest post on her blog! Such a thrill to be sharing this with all of you. If you'd like to see more from Vibrant Beauty Blog, you can check me out on Bloglovin', Twitter, or Facebook. Wow those are some crazy colours! Especially the mint green mascara!! What a fun look! Very inspirational. Definitely pulling out my Luminous Flush for work tomorrow! What an intricate look, very pretty! And I love the mint lower lashes! I absolutely love your bold glowy looks, Jen, even though they're pretty far from what i would wear myself. They always really suit you! I love the eyes Jen! I would not be able to pull off such a look myself but well done on playing with vivid colours! It looks fab and especially loving the mint mascara in your lower lashes! Omg your eye look is amazing!!! Totally loved this look!! Your color coordination there is truly inspirational.